I am the kind of person who likes to do things by the book. At least at first. Tell me the rules, tell me exactly how to do it. Later, I’ll bend or break the rules and make my own way. But first, I like to know what I’m supposed to be doing. 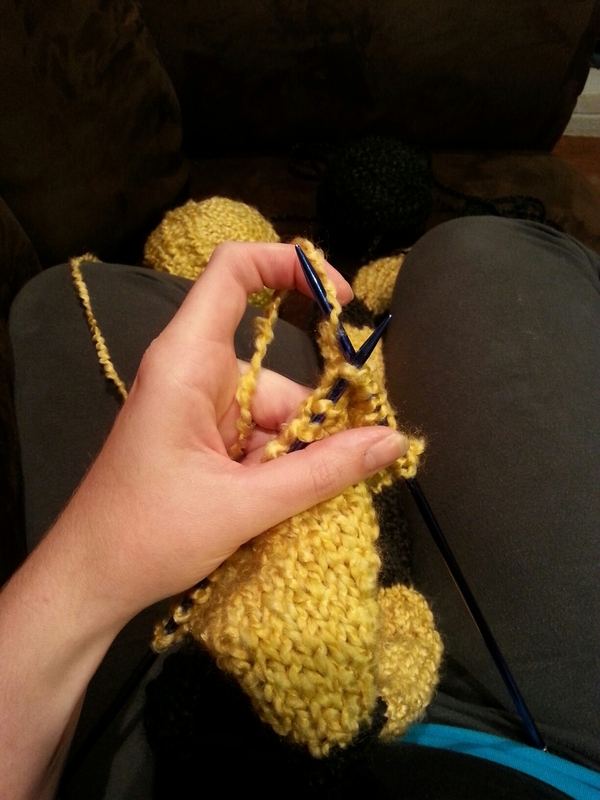 I began knitting when I was nine or so. My mother sat down with me and Steve, who is a year older than me. She taught us the basic knit stitch, which is all she knew. Steve and I made row after row of stitches. I don’t know what Steve thought of this new hobby. I imagine he stopped after being teased about it. There is no end to the things children will be teased for, and boys who knit must be pretty high up. But I loved the orderly rows, and the sense that I was making something. My fingers were stitching together something you could see and touch. Something beautiful that would last. 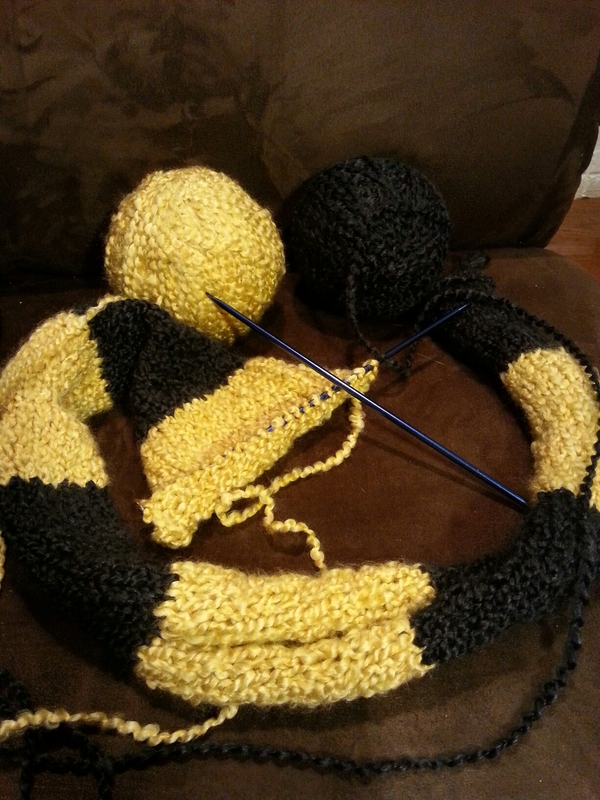 When I ran out of yarn, I abandoned the hobby. Then, in college, I was paired with a roommate who was awful but who nonetheless reminded me of my old pastime. I took it up again. 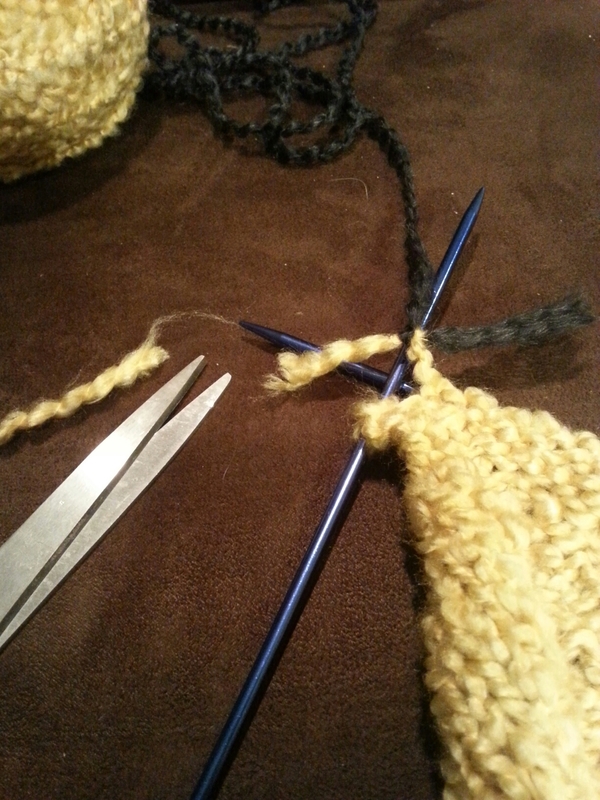 When I grew tired of the knit stitch, I watched a video on YouTube that taught me to purl, too. 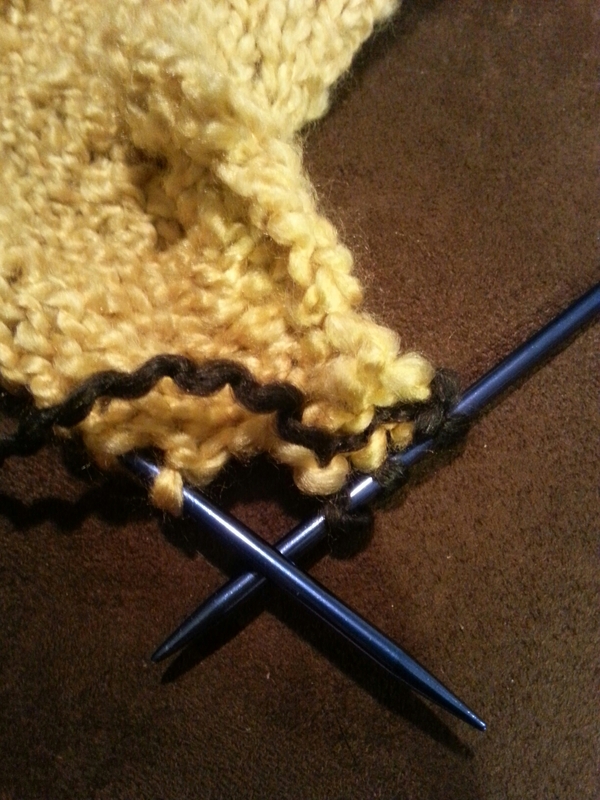 Now I knit and purl and knit and purl to my little heart’s content. Yet there is always the niggling fear that I’m doing it wrong. First, there was the awful college roommate, who laughed at the way I held my yarn. 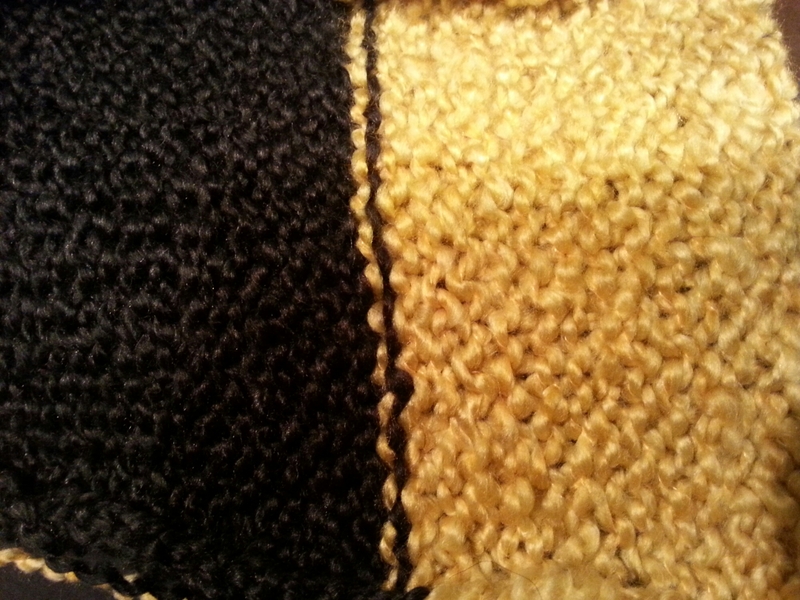 That’s how I learned my mother had taught me the continental stitch, as opposed to, I dunno, the transatlantic stitch. (I know there’s a name for it, but I don’t care enough to look it up.) 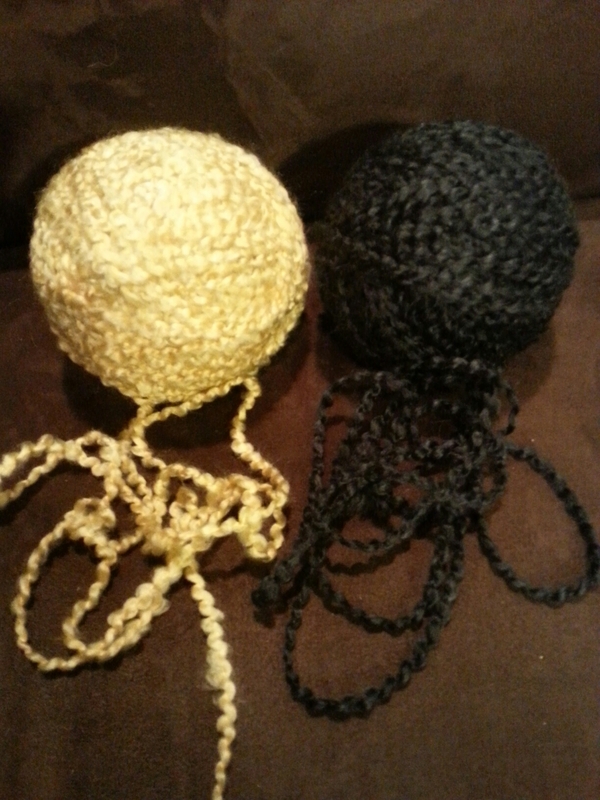 I hold yarn in the left rather than right hand. I couldn’t unlearn it, even though I tried. It seemed so wrong. Now I know it doesn’t matter. No matter how you hold it, the stitches still come out row after row. But back then, I was intimidated by all I didn’t know. 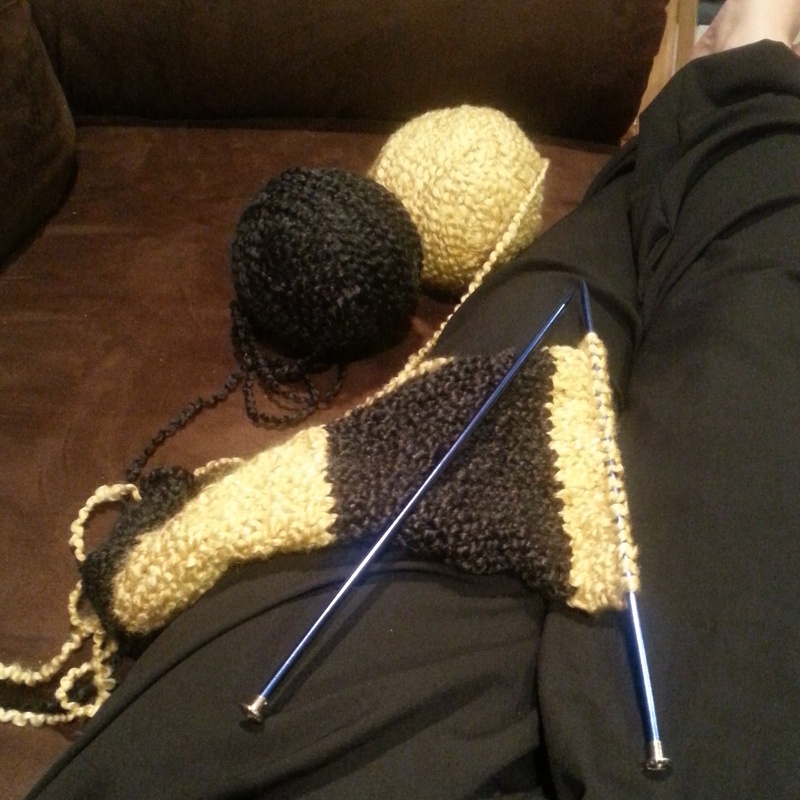 So I stopped knitting again for a few years. I definitely don’t remember knitting again in college. College was really hard. I mean, I know it was hard for everyone, but for me it seemed like a unique and exacting punishment. Punishment for what? I suppose I thought it was for wanting more. More than I deserved. For believing someone like me could become someone else, through the simple alchemy of learning. Someone better. I’ve devised my own system for tracking stitches. I’m very proud of it. If one day I find that I’ve absorbed this by osmosis–if I discover that every other knitter does this too, and I picked it up without realizing it–I will be sad. This is my one original contribution to knitting, or so it seems. And that roommate. She really was awful. She never missed the opportunity to tell me I was white trash, that I didn’t belong at that school and never would. I imagine at some point I began to believe her, because the evidence was everywhere. I worked late at odd jobs while everyone else partied. I ate macaroni (no cheese) for a week straight while my friends took Daddy’s credit card to the mall. I was miserable, and so I decided that I needed to push harder, learn more. I was pot committed. All in. One day, when I got tired of the color I was using, I decided to switch to another. This time, I didn’t have access to the internet, so I devised my own system for stitching colors together. 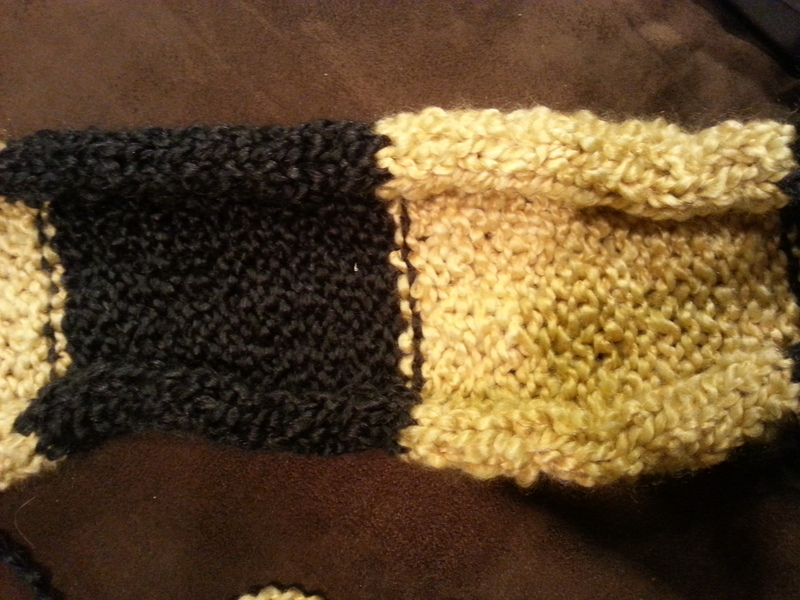 When one row neared the end, I cut the yarn I was using and tied it to another color. 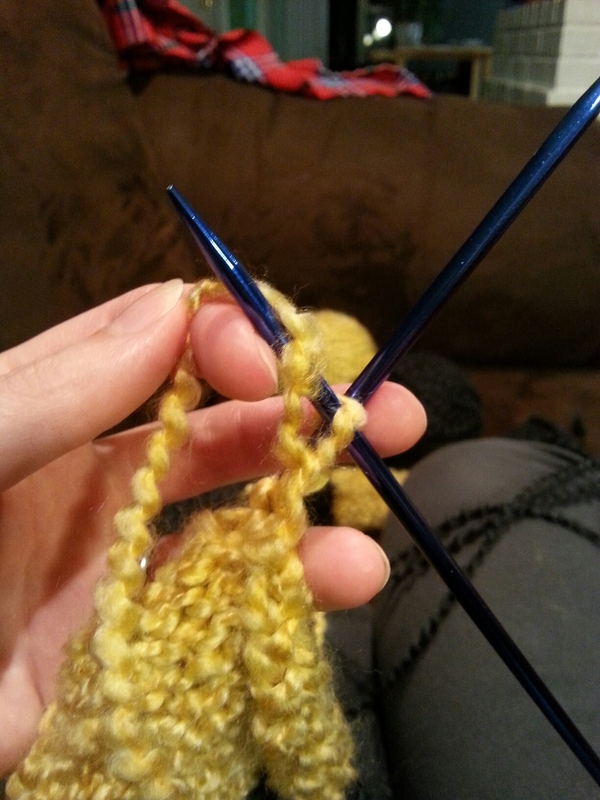 Then I kept knitting, tucking the little knot inside the next row. Is this how everyone else does it? I still don’t know. 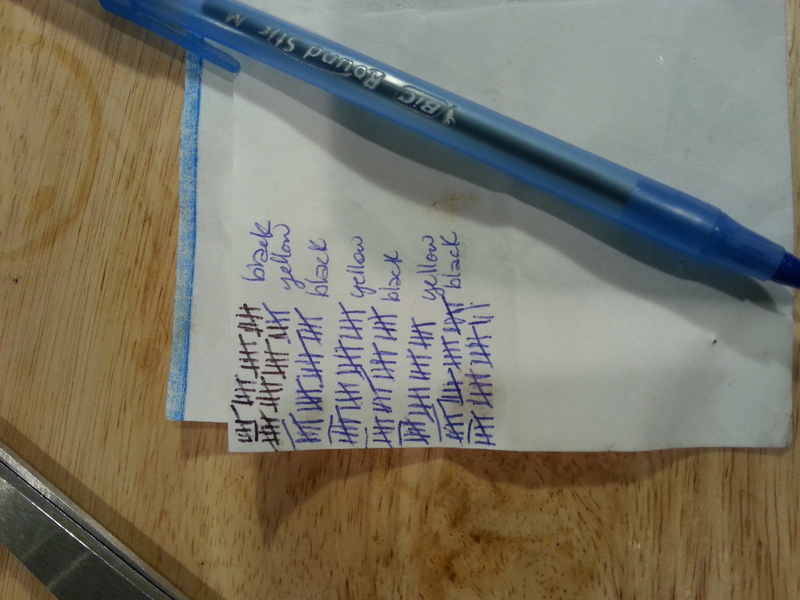 The drawback to this method, as I see it, is the line of colors that mix together. It’s only on the purled side, never on the knitted side. It drives me crazy; it’s so messy, asymmetrical. It taunts me. But I have no idea how to fix it. My siblings were never much for school. It was too limiting, too imposed-from-without, too authoritarian. They were confident they knew everything they needed. What they would need to learn, they all seemed to feel by some instinct, they could not learn in a classroom. But I put all of my faith in education. It was my way up and out, my ticket to a new life. A better self. If I just worked hard enough, learned enough, I could become someone else. Another thing that bothers me is the roll. This doesn’t always happen, but it happens enough to annoy me. The sides of a piece will roll inward. Is it because I am pulling too hard on the stitches? Not hard enough? I can’t figure it out. It seems to depend on the kind of yarn I’m using. I will use an iron to smooth out these rough edges, but it makes me feel like a cheater. I wonder what will happen if other crafters see the shortcuts I take, the imperfections of my amateur work. Will they see these pictures and laugh at me? “That’s such a simple mistake, everyone knows how to fix that!” You see how deep these insecurities run. Is there a YouTube tutorial that would cure me of my self-learned ways? A book I should be reading? Maybe. Probably. Yet I don’t seek them out. I’ve come to take a perverse pleasure in these imperfections. There is something very freeing, I have learned, about going your own way. Making your own mistakes, and finding your own epiphanies. Yeah, I know. Everyone else already knew that; I am, as usual, late to the party. But at least I’m here, right? The thing is, I was wrong. Yeah, my education helped me into a different life. I went to a good school, and a good grad school, and I got a job that I never would have dreamed of before. But knowledge didn’t change me. I’m still the same girl. Still scared that you will look closely enough at me and see that I am faking it. When you examine my seams, you will see that I have no idea how to hold this life together. That I have no idea what I’m doing. Scared that you will find reasons to mock the beautiful things that I am trying to make with my own hands. A few days ago, a friend came over for dinner. 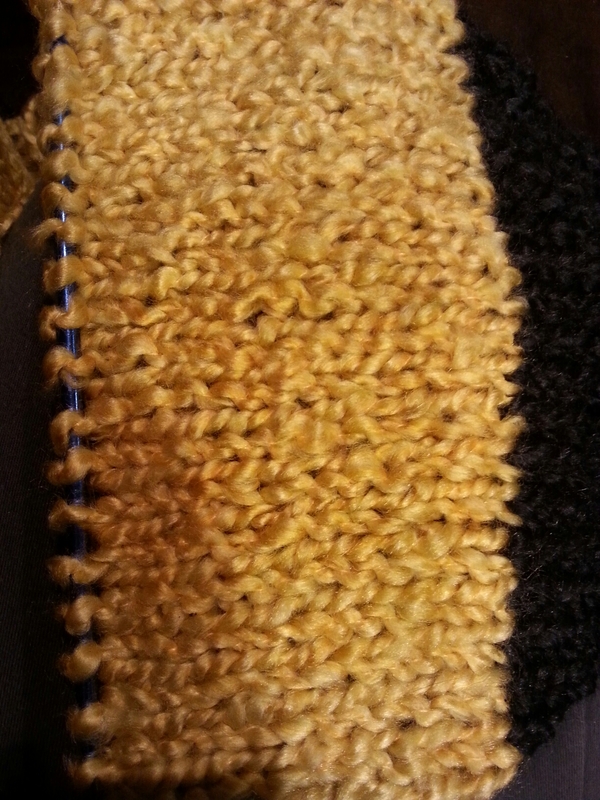 She stood by the coffee table and reached out to touch this scarf, my current work in progress. She ran a finger down the mixed line, that blending of colors that so maddens me. I winced and waited for her judgment: “How… interesting,” I expected her to say.